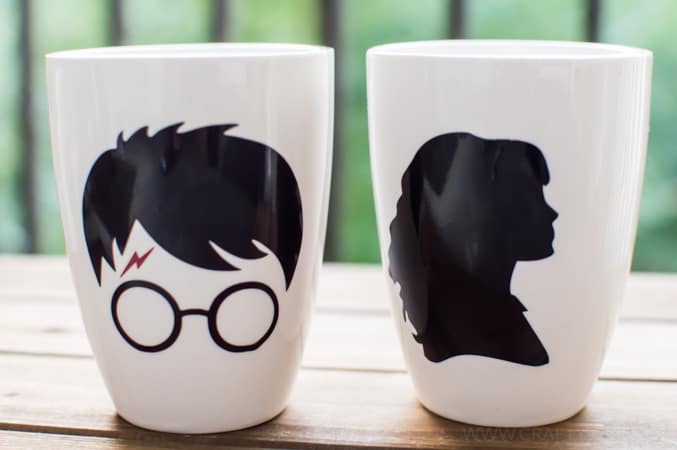 Whether you’re a diehard Harry Potter fanatic or know of someone who is, these custom Harry Potter mugs would be the perfect gift to make the Potterhead in your life! I will never forget how disgusted I was the first time I ever drank coffee. It was at a close friend’s family reunion and we (being 13 and absolutely full of ourselves ridiculous) thought we were so cool sneaking sips of coffee when our parents weren’t looking. I’ll never forget the bitterness of black coffee and the laughs we endured when our parents eventually caught us cradling our cups in the corner of the room. Six years later I started working at Borders Book Store and helped out in the coffee shop upstairs every-so-often (ironic, no?). It was there that I discovered the Americano and they joys of an espresso buzz. That first bitter taste at 13 was slowly becoming a distant memory. And when I finally figured out that I could add ten (yes, ten….I have a sugar problem) pumps of caramel into my coffee cups I discovered my love of coffee. And my obsession with coffee mugs. I mean, the two do go hand in hand. To this day I still cannot drink a cup of black coffee. I have to load it up with cream and sugar or I just can’t drink it. Chris doesn’t understand my coffee addiction (or my sugar one for that matter), which is fine by me because that means I don’t have to share my beloved k-cups. But he does love a good and clever coffee mug. As long as it’s something nerdy and fun, of course! Twice a year I love to hunker down on the weekend and have a Harry Potter movie marathon. When Chris and I first started dating I told him he either had to watch the movies with me or we weren’t going to work out. He, being the ever so flexible guy that he is, chose to spend one weekend watching nothing but Harry Potter with me and actually liked them! I figured if he could put up with my insane obsession with the wizarding world he’d be the guy for me. Now that we have a baby it’s a little harder to watch eight movies in two days. Our Harry Potter weekends have become Harry Potter months, but that’s okay with us. We usually put our little guy down for a nap and are able to watch one movie while he sleeps. And sometimes we put one in after he goes to bed in the evenings. Though, most of the time Chris finds me passed out and drooling next to my coffee mug about halfway through and then we give up and just go to bed. That’s what having kids has done to me. No more late night Harry Potter binge watching unfortunately! Cut out the designs on your vinyl and weed them. If this is your first time using Oracle 651 (which is a more permanent type of vinyl) I would suggest trying to cut designs that are bigger and don’t have too many small pieces (I say this after many attempts at trying to cut a different design and failing miserably). Place contact paper over top your designs and then cut them out. Make sure you cut close to your designs without accidentally cutting the vinyl! It makes applying your design to the cup much easier. To put my designs on a curved surface, I followed this tutorial and also found this one to be helpful! Sometimes it’s a little difficult to get your designs to curve the way they need to so you may need some extra help! Smooth the designs out and peel back the contact paper. And now, sit back and admire your work! Honestly these mugs were super easy and I am so excited about how they turned out! Even Chris was impressed and couldn’t wait to use his, so I guess we’ll be having some hot apple cider in the near future. 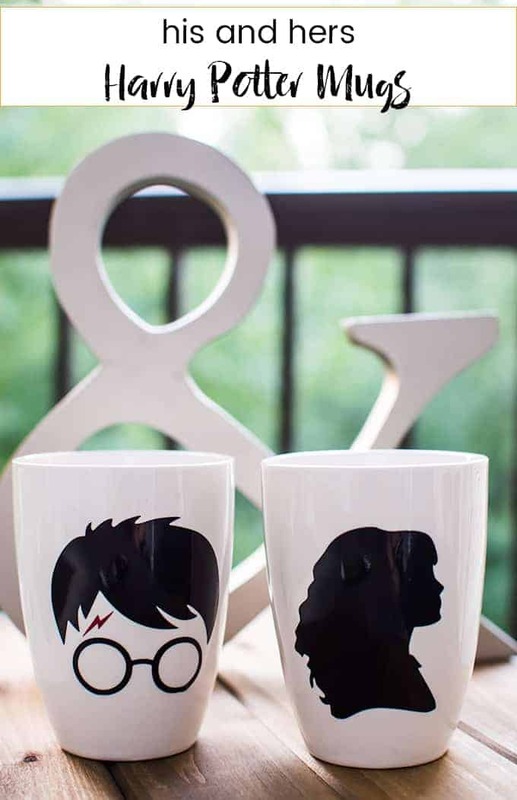 I’m thinking a Harry Potter book or movie marathon is called for, especially now that I can show my HP pride with these fun Harry Potter mugs! If you make these mugs for yourself, please be aware that they are not dishwasher safe. You don’t want to ruin all that hard work! And what’s better than one Harry Potter post? How about eight more?! Check out some mouthwatering recipes, fun craft ideas, and awesome ideas for the best ever Harry Potter themed party! Do you buy the image files from Silhouette? Or do you find them online? This is a cute idea and it looks simple enough to make! Thank you so much! It was an incredibly simple task (once I figured out how to cut the vinyl, haha) and they came out great! Thank you so much for stopping by to check them out! I’m still new to the Silhouette world and I’ve never heard of oracle 651. Good to know that there’s extra sticky vinyl for things that will get lots of use and washed. I just recently heard of it but I agree, it’s nice to know that you can use this stuff and it takes a long time to show any wear and tear! Teresa, I LOVE these. I’m not even a huge Harry Potter fan but these would make great gifts. I absolutely love your blog and all your projects are so fun. You rock. Hi Sam! Thank you SO much! 🙂 These mugs make me want to make more because they were so fun and easy to do! I love having you visit the blog, thanks for stopping by! So what is the difference between the oracle and the regular sticky vinyl? I was thinking of doing something like this using my cricut to make some mason jars with Apple monograms filled with pencils for my teacher friends for Christmas! Oracle 651 is a more permanent vinyl that can last up to 6 years with gentle washing and handling! I’m not sure how long regular sticky vinyl will last though. I think if you’re giving someone a gift oracle 651 is the way to go because of the long life! And by the way, I think that’s such a cute idea for Christmas gifts this year! Hi Megan! I got it from the Harry Potter Vinyl Group that I am in on Facebook! If you search for the group you can join and will be able to download the file! Hi Megan! I’m a part of the Harry Potter Vinyl Group on Facebook! If you look it up under that name you should be able to request to join! Where did you get the Harry Potter design? I am excited to try these as my first vinyl project on my Silhoette! Thank you. Hi Kallie! I am a part of the Harry Potter Vinyl Group on Facebook and that’s where I got the Harry Potter design! I found the Hermione one on google and traced it myself! Good luck with your first project! Please come back and share how they turned out! Thanks Amberly!! I’m a total enabler so I think you should get one. 😉 They’re a lot of fun! I have searched Face Book for Harry Potter Vinyl Group and can’t find anything. Any other ideas on how to find the designer of the files you showed on the mugs? Than you! Hi Katie! The name of the group is Accio Cameo on facebook!